Adele'in (resimde) 21 albümü 2012 yılının en çok satan albümü oldu. Bu onun ABD listelerindeki ikinci ardışık zirvesiydi ve Michael Jackson'ın 1983 ve 1984 Thriller albümü ile ulaştığı başarının aynısını yaşayarak tarihteki ikinci sanatçı oldu. ^ Caulfield, Keith (2011-12-28). "Michael Buble's 'Christmas' Spends Fifth Week at No. 1, Adele's '21' Has Best Sales Week Yet". Billboard. Erişim tarihi: 2011-12-28. ^ Caulfield, Keith (2012-01-04). 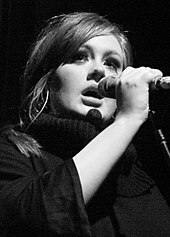 "Adele's '21' Claims 14th Week Atop Billboard 200". Billboard. Erişim tarihi: 2012-01-04. ^ Caulfield, Keith (2012-01-11). "Adele's '21' Hits 15th Week at No. 1". Billboard. Erişim tarihi: 2012-01-11. ^ Caulfield, Keith (2012-01-18). "Adele Matches 'Titanic's' No. 1 Run Atop Billboard 200". Billboard. Erişim tarihi: 2012-01-18. ^ Caulfield, Keith (2012-01-25). "Adele's '21' - Biggest No. 1 Album Since 'Bodyguard'". Billboard. Erişim tarihi: 2012-01-25. ^ Caulfield, Keith (2012-02-01). "Tim McGraw Scores Top Billboard 200 Debut, Adele Still No. 1". Billboard. Erişim tarihi: 2012-02-01. ^ Caulfield, Keith (2012-02-08). "Lana Del Rey Debuts at No. 2 on Billboard 200 Albums Chart". Billboard. Erişim tarihi: 2012-02-08. ^ Caulfield, Keith (2012-02-15). "Adele's '21' Hits 20th Week at No. 1, Van Halen Debuts at No. 2". Billboard. Erişim tarihi: 2012-02-15. ^ Caulfield, Keith (2012-02-21). "Adele's '21' Hits 21st Week at No. 1; Sells 730,000 Post-Grammys". Billboard. Erişim tarihi: 2012-02-21. ^ Caulfield, Keith (2012-02-29). "Adele's '21': Longest-Running No. 1 Album Since 'Purple Rain'". Billboard. Erişim tarihi: 2012-02-29. ^ Caulfield, Keith (2012-03-07). "Kid Cudi's WZRD Scores Top Billboard 200 Debut, Adele Still No. 1". Billboard. Erişim tarihi: 2012-03-07. ^ Caulfield, Keith (2012-03-14). "Bruce Springsteen Squeaks By Adele, Earns Tenth No. 1 Album". Billboard. Erişim tarihi: 2012-03-14. ^ Caulfield, Keith (2012-03-21). "One Direction Makes History With No. 1 Debut on Billboard 200". Billboard. Erişim tarihi: 2012-03-21. ^ Caulfield, Keith (2012-03-28). "'Hunger Games' Soundtrack Debuts at No. 1 on Billboard 200". Billboard. Erişim tarihi: 2012-03-28. ^ Caulfield, Keith (2012-03-28). "Madonna Debuts at No. 1 on Billboard 200, Lionel Richie at No. 2". Billboard. Prometheus Global Media. Erişim tarihi: 2012-03-28. ^ Caulfield, Keith (2012-04-11). "Nicki Minaj's 'Pink Friday: Roman Reloaded' Debuts At No. 1 On Billboard 200". Billboard. Prometheus Global Media. Erişim tarihi: 2012-04-11. ^ Caulfield, Keith (2012-04-18). "Lionel Richie's 'Tuskegee' Hits No. 1 on Billboard 200". Billboard. Prometheus Global Media. Erişim tarihi: 2012-04-18. ^ Caulfield, Keith (2012-04-25). "Billboard 200: Lionel Richie Holds Off Jason Mraz, Stays At No. 1". Billboard. Prometheus Global Media. Erişim tarihi: 2012-04-25. ^ Caulfield, Keith (2012-05-02). "Jack White Debuts At No. 1 on Billboard 200". Billboard. Prometheus Global Media. Erişim tarihi: 2012-05-02. ^ Caulfield, Keith (2012-05-09). "Carrie Underwood's 'Blown Away' Debuts At No. 1 With Best Country Sales In Months". Billboard. Prometheus Global Media. Erişim tarihi: 2012-05-09. ^ Caulfield, Keith (2012-05-16). "Carrie Underwood's 'Blown Away' Nabs Second Week at No. 1". Billboard. Prometheus Global Media. Erişim tarihi: 2012-05-16. ^ Caulfield, Keith (2012-05-23). "Adam Lambert Snags First No. 1 Album on Billboard 200 Chart". Billboard. Prometheus Global Media. Erişim tarihi: 2012-05-23. ^ Caulfield, Keith (2012-05-30). "John Mayer Earns Third No. 1 Album on Billboard 200". Billboard. Prometheus Global Media. Erişim tarihi: 2012-05-30. ^ Caulfield, Keith (2012-06-06). "John Mayer's No. 1 for Second Week on Billboard 200". Billboard. Prometheus Global Media. Erişim tarihi: 2012-06-06. ^ Caulfield, Keith (2012-06-13). "Alan Jackson Scores Top Debut on Billboard 200, Adele's Back at No. 1". Billboard. Prometheus Global Media. Erişim tarihi: 2012-06-13. ^ Caulfield, Keith (2012-06-20). "Usher's 'Looking 4 Myself' Is Singer's Fourth No. 1 Album on Billboard 200". Billboard. Prometheus Global Media. Erişim tarihi: 2012-06-20. ^ Caulfield, Keith (2012-06-27). "Official: Justin Bieber's 'Believe' Is Year's Biggest Debut, Bows at No. 1". Billboard. Prometheus Global Media. Erişim tarihi: 2012-06-27. ^ Caulfield, Keith (2012-07-04). "Linkin Park Squeaks By Maroon 5, Hits No. 1 on Billboard 200". Billboard. Prometheus Global Media. Erişim tarihi: 2012-07-04. ^ Caulfield, Keith (2012-07-11). "Chris Brown's 'Fortune' Album Debuts at No. 1 on Billboard 200 By Chris Brown, Hits No. 1 on Billboard 200". Billboard. Prometheus Global Media. Erişim tarihi: 2012-07-11. ^ Caulfield, Keith (2012-07-18). "Zac Brown Band, Frank Ocean Debut at Nos. 1 & 2 on Billboard 200". Billboard. Prometheus Global Media. Erişim tarihi: 2012-07-18. ^ Caulfield, Keith (2012-07-25). "Nas Bows at No. 1 with 'Life is Good'". Billboard. Prometheus Global Media. Erişim tarihi: 2012-07-25. ^ Caulfield, Keith (2012-08-01). "Zac Brown Band Reclaims Top Spot on Billboard 200". Billboard. Prometheus Global Media. Erişim tarihi: 2012-08-01. ^ Caulfield, Keith (2012-08-08). "Rick Ross Scores Fourth No. 1 Album with 'God Forgives, I Don't'". Billboard. Prometheus Global Media. Erişim tarihi: 2012-08-08. ^ Caulfield, Keith (2012-08-15). "'Now 43' Scores Franchise's 16th No. 1 on Billboard 200 Chart". Billboard. Prometheus Global Media. Erişim tarihi: 2012-08-15. ^ Caulfield, Keith (2012-08-22). "2 Chainz Debuts at No. 1 on Billboard 200". Billboard. Prometheus Global Media. Erişim tarihi: 2012-08-22. ^ Caulfield, Keith (2012-08-29). "Trey Songz Gets First No. 1 Album on Billboard 200". Billboard. Prometheus Global Media. Erişim tarihi: 2012-08-29. ^ Caulfield, Keith (2012-09-05). "TobyMac Earns First No. 1 Christian Album on Billboard 200 Since 1997". Billboard. Prometheus Global Media. Erişim tarihi: 2012-09-05. ^ Caulfield, Keith (2012-09-12). "Matchbox Twenty Scores First No. 1 Album On Billboard 200". Billboard. Prometheus Global Media. Erişim tarihi: 2012-09-12. ^ Caulfield, Keith (2012-09-19). "Dave Matthews Band Debuts at No. 1 on Billboard 200". Billboard. Prometheus Global Media. Erişim tarihi: 2012-09-19. ^ Caulfield, Keith (2012-09-26). "Pink Earns First No. 1 Album on Billboard 200 Chart". Billboard. Prometheus Global Media. Erişim tarihi: 2012-09-26. ^ Caulfield, Keith (2012-10-03). "Mumford & Sons' 'Babel' Scores Biggest Debut of Year, Bows at No. 1 on Billboard 200 Chart". Billboard. Prometheus Global Media. Erişim tarihi: 2012-10-03. ^ Caulfield, Keith (2012-10-10). "Muse's 'The 2nd Law' Leads Seven Top 10 Debuts on Billboard 200". Billboard. Prometheus Global Media. Erişim tarihi: 2012-10-10. ^ Caulfield, Keith (2012-10-17). "Macklemore & Ryan Lewis Score Top Billboard 200 Debut, Mumford Still No. 1". Billboard. Prometheus Global Media. Erişim tarihi: 2012-10-17. ^ Caulfield, Keith (2012-10-24). "Jason Aldean's 'Night Train' Rolls to No. 1 On Billboard 200". Billboard. Prometheus Global Media. Erişim tarihi: 2012-10-24. ^ Caulfield, Keith (2012-10-31). "Taylor Swift's 'Red' Sells 1.21 Million; Biggest Sales Week for an Album Since 2002". Billboard. Prometheus Global Media. Erişim tarihi: 2012-10-31. ^ Caulfield, Keith (2012-11-07). "Taylor Swift Still Rules Billboard 200, Meek Mill Starts at No. 2". Billboard. Prometheus Global Media. Erişim tarihi: 2012-11-07. ^ Caulfield, Keith (2012-11-14). "Taylor Swift's 'Red' Still No. 1, 'Now 44' Scores Top Debut". Billboard. Prometheus Global Media. Erişim tarihi: 2012-11-14. ^ Caulfield, Keith (2012-11-20). "One Direction's 'Take Me Home' Debuts at No. 1 With Year's Third-Biggest Opening". Billboard. Prometheus Global Media. Erişim tarihi: 2012-11-20. ^ Caulfield, Keith (2012-11-27). "Rihanna Earns First No. 1 Album on Billboard 200 Chart". Billboard. Prometheus Global Media. Erişim tarihi: 2012-11-27. ^ Caulfield, Keith (2012-12-04). "Alica Keys Earns Fifth No. 1 Album on Billboard 200 Chart". Billboard. Prometheus Global Media. Erişim tarihi: 2012-12-04. ^ Caulfield, Keith (2012-12-12). "Taylor Swift's 'Red' Back at No. 1, Wiz Khalifa and Ke$ha Debut Top 10". Billboard. Prometheus Global Media. Erişim tarihi: 2012-12-12. ^ Caulfield, Keith (2012-12-19). "Bruno Mars Debuts at No. 2 as Taylor Swift's 'Red' Still Rules". Billboard. Prometheus Global Media. Erişim tarihi: 2012-12-19.